Spray a skillet with nonstick spray. Quickly saute the meat until the meat is just barely cooked on all sides. Add to a 4-quart slow cooker. Stir. In a small bowl, stir together the tomatoes, peppers, beans, and spices. Pour over the meat mixture. Stir to evenly combine. Cook on low 7-8 hrs and then high until ready to serve (up to 2 hours). If the chili looks watery then turn up to high and leave the lid ajar for 30 minutes or until thickened. Preheat oven to 400. Bake potatoes until fully cooked, about 1 hour. Slice in half lengthwise and allow to cool slightly. Scoop out the potatoes into a large bowl, reserving the skins. Mash with a potato masher. Stir in the chili to evenly distribute it in the potatoes while still leaving the meat and beans whole. 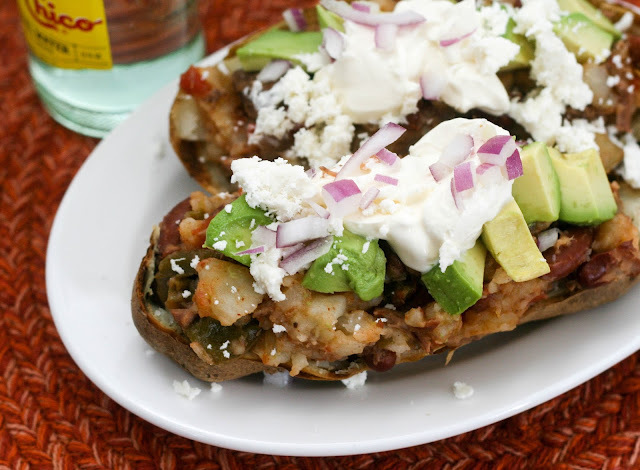 Scoop back into the skins, top with avocado, sour cream, red onion and queso fresco. Potatoes can be made ahead. Reheat and garnish with sour cream, onion, avocado and cheese prior to serving. Although I like to think that spring is right around the corner, in reality, it is still somehow January. Sigh. We had a few relatively balmy days there and now we are back baking to warm the house. Anyway, I hear there is some sort of sporting event this weekend so I thought it would be a good time to post this wintery, filling twist on baked potatoes. They aren't twice-baked so they come together a little more quickly and since the chili is made in the slow cooker (which is perfectly safe, This Is Us viewers) there is very little hands-on time. These potatoes are so filling, just half with some sides (chips and guac anyone?) is a full meal. I know a lot of Super Bowl parties are all snacks all the time but adding these filling, protein-rich potatoes will surely be welcome and only slightly more difficult than just making chili.